The 35th Infantry Regiment Association salutes our fallen brother, PFC Thomas Monk, who died in the service of his country on February 24th, 1967 in Binh Dinh Province, Vietnam. The cause of death was listed as Small Arms/AW. 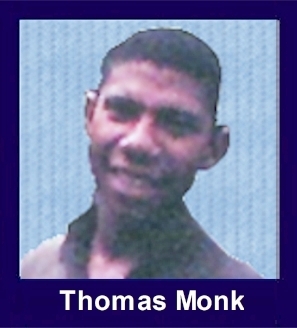 At the time of his death Thomas was 19 years of age. He was from New York, New York. Thomas is honored on the Vietnam Veterans Memorial at Panel 15E, Line 86. The decorations earned by PFC Thomas Monk include: the Combat Infantryman Badge, the Bronze Star with V, the Purple Heart, the National Defense Service Medal, the Vietnam Service Medal, the Vietnam Campaign Medal and the Vietnam Cross of Gallantry with Palm Unit Citation. For heroism in connection with military operations against an armed hostile force on 24 February 1967, in the Republic of Vietnam. Private First Class Monk distinguished himself while serving as a grenadier with the weapons platoon of Company B, 1st Battalion, 35th Infantry, on a search and destroy mission near Bong Son. Moving through dense underbrush, the unit was fired on by a well-hidden sniper. The point squad immediately returned fire while the remainder of the platoon maneuvered into position. Private First Class Monk quickly located the enemy position, but did not have a clear field of fire. With complete disregard for his own safety, he crawled into a small open area in order to place a well-aimed shot. As soon as was in the open, his movements were detected by the enemy and he was wounded. Neglecting his wounds, he accurately fired five rounds from his grenade launcher and killed the sniper, allowing the platoon to proceed with its mission. In the course of the action, Private First Class Monk was mortally wounded by enemy fire. His outstanding display of aggressiveness, devotion to duty, and personal bravery was in keeping with the highest traditions of the military service and reflects distinct credit upon himself, his unit, and the United States Army.